Grant has been sick, off and on, for the past few weeks. As a surprise for him when he finally began to feel better, I decided to try my hand at making cinnamon rolls from scratch. 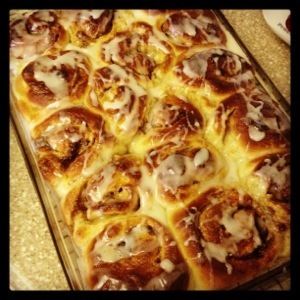 In Uzbekistan, one of our housekeeper’s specialties was cinnamon rolls, and they were incredibly delicious. While I was a bit worried about mine not being able to hold up to the memory of her’s, once I the idea of making them had been implanted in me, I could think of little else. The plan was to start making them early enough so Grant would wake up to the smell of them baking in the oven. Unfortunately, the plan failed for a number of reasons: 1) They took longer for me to make than I had originally anticipated, 2) Grant woke up much earlier than I had expected, and 3) He was still a little sick, which means his sense of smell was a bit dulled so he couldn’t smell them baking anyway. Despite the failure of my original plan, I did keep what I was making a secret, and it was worth it because not only was he very surprised (and impressed) but they actually turned out to be incredibly delicious. The cinnamon rolls themselves are not “typical” rolls, in that they have some citrus in them and therefore aren’t quite as sweet as many of the rolls out there. I also chose to make a light glaze to go on top instead of the traditional cream cheese frosting, which I feel allowed the flavor of the rolls to really stand out. Warm milk to 110 F (43 C) on the stove and pour the warmed milk into the bowl of a stand mixer. Dissolve the yeast in the milk and let stand until foamy, roughly 10 minutes. Add the sugar, eggs, flour, and salt, and knead on low speed using the dough hook. Add more flour, if needed, until ingredients come together. Put the butter in and keep kneading the dough until it is smooth and springs back, about 7 minutes. Form the dough into a ball and put it in a large, lightly oiled bowl, covering with plastic wrap. Let the dough rise, at room temperature, until it doubles, 1 1/2-2 hours. Punch down the dough, turn it out onto a lightly floured surface, and cut it in half. Roll one half out into a 9-by-13 inch rectangle. Spread with half of the butter, sprinkle with half the brown sugar, half of the cinnamon, and half of the zest. Starting at the long side close to you, roll the rectangle into a log, moving away from you, then cut into 8 slices. Repeat steps 6 and 7 with the other half of the dough. Arrange slices in a buttered 9-by-13 inch baking dish and cover loosely with plastic wrap. Let stand in a warm, draft-free spot until it gets puffy, about an hour. Alternatively, refrigerate overnight then let it sit at room temperature 30-60 minutes before baking. With a rack set in the middle of the oven, preheat to 400 F (200 C). Bake 20-25 minutes, until rolls are golden brown and a toothpick inserted into the center comes out clean. Flip the rolls over so the liquidy cinnamon and sugar has a chance to reach every part of the roll. Let rolls cool slightly before glazing, but put the glaze on when they are still warm.